Fifteen-year-old Adam knows he is no super-hero. Still, his must try to solve the mystery of his mother’s threatening letters, his little brother’s anxiety, and, if he can get himself under control, maybe win the girl. For Robin, he will try to be Batman. 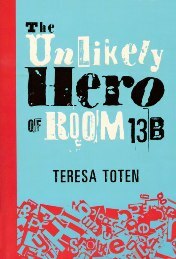 A funny, awkward tale about a boy, a girl, and mental illness. what a GREAT book. best one. amazing. I think this book is not good for young people because it has a lot of bad words. But for me it’s fun. This book is so funny because the boy is trying to win a girl which is sweet.